In unspoilt countryside, a land rich in history and tradition, in an attractive area for nature and tranquility living longer by more than a hundred years the olive trees of the farm Sansonetti. We are located in the popular High lowlands of Puglia land that history and tradition has always been dedicated to the production of extra virgin olive oil, we are a family of traditional country and believe that a good oil always born from expertise, but mainly from the processing of a 'excellent raw material: the Olive Peranzana. A fruity sweet flavor with notes of artichoke, which is associated with a hint of green tomato and almond is the identikit of the oil obtained from the "Peranzana ', with a typical which finds its origin in the tradition, in the genotype and particular soil and climate territorio.L 'pride of our work is the CIVETTUOLO oIL, an oil that contains the tradizionePugliese, the secrets handed down from our grandparents and our passion devoted to reap the fruits of their labor. 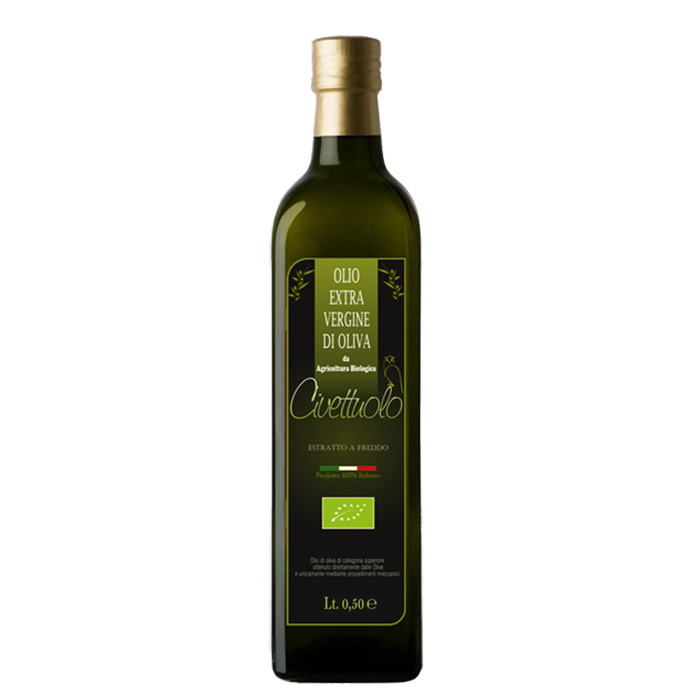 The CIVETTUOLO Extra Virgin Olive Oil is produced in accordance with the Disciplinary Organic Agriculture exclusively from olives harvested in the groves of our Azienda.Le olives, a few hours after collection, they come to the mill fresh and healthy: an essential condition for an oil fruity aroma and flavor characteristic of oliva.Si get so 'a real "olive juice" absolutely natural and rich in antioxidant compounds, valuable assets for our organization. The flavor is delicate and complex, it is accompanied by significant shades of thistle, artichoke. Equipped with fruity notes of green olive, light and herbaceous.